Francesco Mancini trained in Bologna. His first important commission came in 1713, when Pietro Canneti commissioned from him the frescoes for the new library of the Camaldolese monastery at Classe, near Ravenna. A recommendation from Abbot Canneti secures a commission for frescoes in the Duomo of Foligno in 1719-23 (see below). He moved to Rome in 1724 and was appointed as the principal of the Accademia di S Luca there in 1750-51. This altarpiece, which was originally oval, is of unknown provenance and is now in the Pinacoteca. It is a replica of an one that Francesco Mancini sent from Rome to Fano in 1726 in thanks for having been given citizenship there. This original is now in the Pinacoteca there (search on “Battista” to see an illustration). There is a similar copy that is now in the Museo Diocescano, Perugia (see below): both are attributed to Francesco Mancini or his workshop. This panel from San Filippo Neri is now in the Pinacoteca Comunale. It depicts St Peter fleeing from martyrdom in Rome: he has a vision of the Risen Christ, who asks him “Quo vadis” (where are you going), and is shamed into returning to embrace his fate. In 1719, when the remodelling of the apse of the Duomo had been completed, the notary Giustiniano Pagliarini wrote to his friend, Abbot Pietro Canneti (above) seeking advice on an appropriate artist for the execution of its frescoes. Pietro Canneti suggested Francesco Mancini, who had just completed the frescoes for Canneti’s new library at Classe. The choice was not universally popular (other proponents supported Giuseppe Nicolò Nasini and Francesco Trevisani) but Pagliarini had his way. ✴St Felician entrusting Foligno to Religion (in the lunette of the apse). ✴the Blessed Angelina of Montegiove. There is a small figure of a kneeling donor (presumably Giustiniano Pagliarini) behind them (at the extreme left). Decio degli Onofrio commissioned an altarpiece for the Cappella della Pietà (in the left aisle) from Francesco’s nephew, Luca Mancini. Francesco Mancini approved its design before it was sent to Foligno from Rome in February 1755. The note that announced its imminent dispatch of the altarpiece itself a few months later recorded that it had been completed “sotto la correzione del Zio” (under the direction of the uncle, i.e. Francesco Mancini). This altarpiece, which is the only known work by Luca Mancini, depicts the dead body of Christ in the lap of the Virgin, with grieving angels behind. 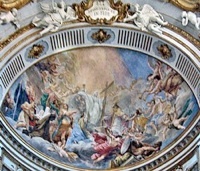 This fresco in the cupola of San Filippo Neri depicts the figures of the Trinity crowning the Virgin. This altarpiece, which is of unknown provenance, is now in the Museo Capitolare. It is a replica of an one that Francesco Mancini sent from Rome to Fano in 1726 in thanks for having been given citizenship there. This original is now in the Pinacoteca there (search on “Battista” to see an illustration). There is a similar copy that is now in the Pinacoteca, Bevagna (see above): both are attributed to Francesco Mancini or his workshop. This altarpiece from Santa Teresa degli Scalzi, which is signed by Francesco Mancini and dated by inscription, is now in the Galleria Nazionale. A design for it is in the collection of the Fondazione Cassa di Risparmio di Pesaro in Palazzo Montani-Antaldi, Pesaro. Return to Art in: Bevagna Città di Castello Foligno Perugia.